As discussed earlier, Oregon incomes continued to rise and the poverty rate ticked down. This post is a quick update on trends we are seeing across Oregon’s metro areas. For rural income trends, we need to wait until December when the 5 year ACS estimates are released. 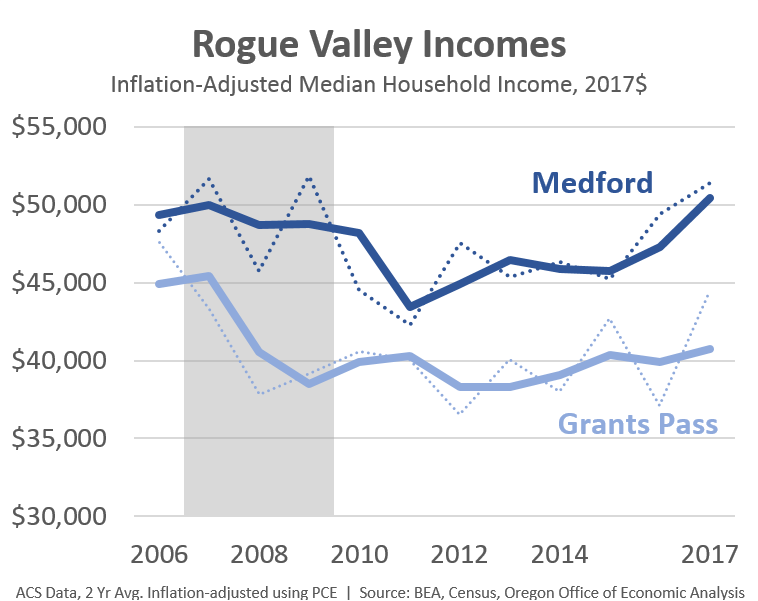 Traveling north on I-5 a bit, incomes throughout the Willamette Valley continue to show good growth in the latest data. 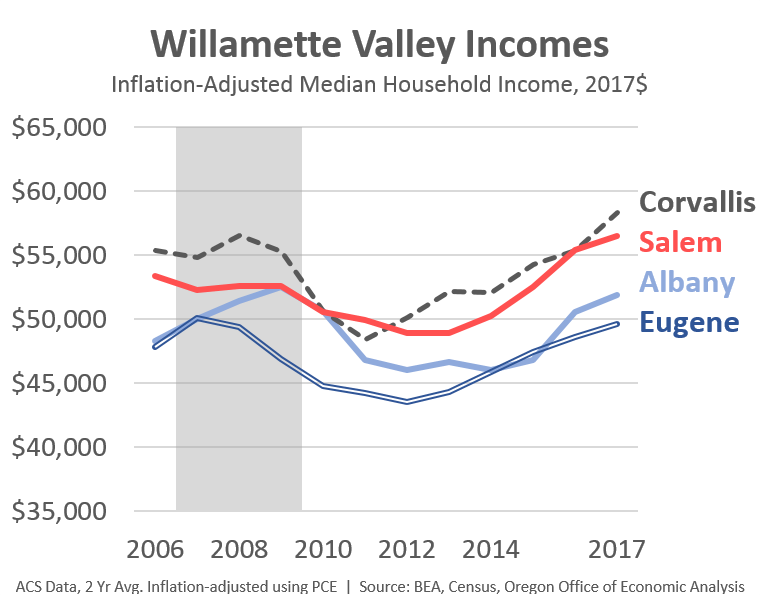 Salem and Corvallis incomes are now at historic highs, while Albany and Eugene incomes are essentially back to where they were at the start of the Great Recession. Further north, the Portland region continues to see strong gains. Like the state overall, 2017 increases were a bit slower, but continue to outpace most other large metros across the country. 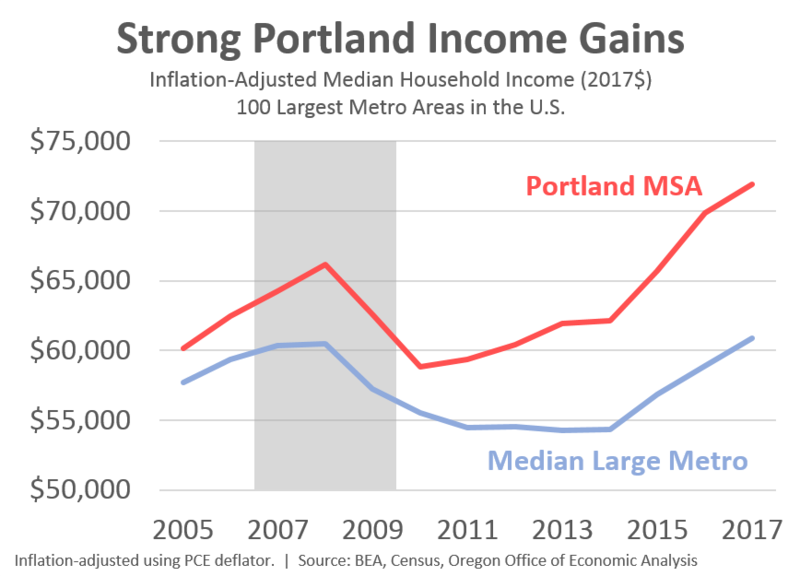 The Portland MSA’s median household income now ranks 16th highest among the nation’s 100 largest metros. In 2007, Portland ranked 32nd highest. As noted in the statewide trends, the leveling out of the poverty rate was also seen in the Portland region. Similarly, the poverty rate differences between racial and ethinic groups was evident in Portland as well. As such, it is reasonable to conclude that outside the Portland area, Oregon’s poverty rates continued to decline. Finally, let’s cross the mountains and check in on Bend where we know growth has been and continues to be robust. 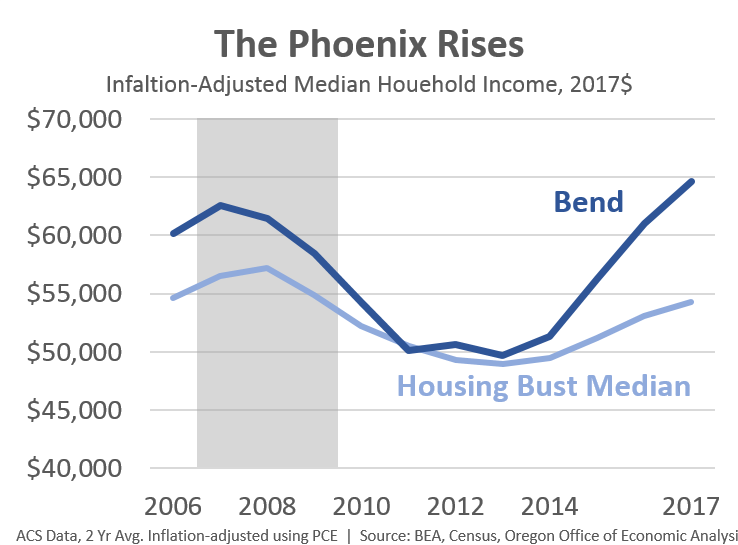 Household income in Deschutes County saw another strong year in 2017 and compared with the other housing bust metros across the country, Bend continues to outperform. Among these 50 metros, Bend’s income growth since the onset of the recession ranks 5th best. Medford, which is also among the worst housing bust metros nationwide, ranks 15th best.